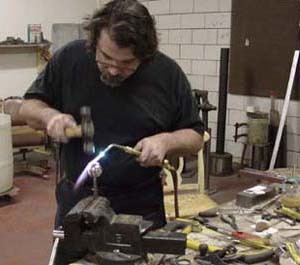 For a sword to fullfill its potential, it is vitally important that the hilt is properly made. 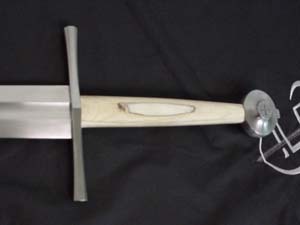 The mass of the pommel must be adjusted for best possible heft and performance of the blade. 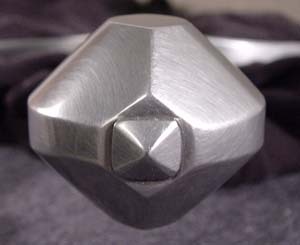 Guard and pommel must be mounted with a sturdy and precise fit. The grip must be shaped to allow a good control of the blade and a secure purchase. The hilt should also have good proportions and be made in a style that is in accord with the historical period and type of the sword. 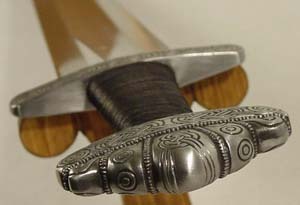 To look right, the hilt components need to capture the subtleties of volume and form that original hand-forged hilt components possess. Working from Peter's exhaustive documentation of originals in museums and private collections, the designs are based on his detail drawings and hundreds of photographs of original pieces. As a result of Peter's research, wax models can be made that reflect the character and shape of hand-forged originals while lending themselves to a production environment. Investment casting from a hand-carved wax original is the closest we can come without hand-forging each original piece, which would be time consuming and make our swords prohibitively expensive. It is important to note that Albion uses only the more expensive and precise investment casting process (also known as the "lost wax" method), rather than the less expensive and easier sand-casting process. Sand casting can be perfect for certain applications, but the subtleties demanded by our recreations cannot be achieved through this method. Many hours of exacting work are invested in the making of the hilt components from wax original to finished piece ready to be mounted on a sharp blade. An original master for each component is carved from a block of hard modeling wax. 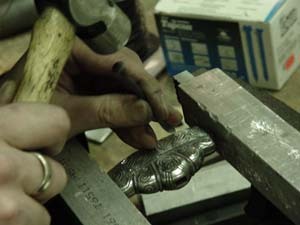 This is a painstaking process and requires hours of carving and polishing. The wax original must incorporate all of the details and capture the characteristic shape of the original. The correct size of the pommel is arrived at by testing a prototype blade for optimum balance in handling and performance. Once a wax original is made, it must be molded in two matching halves. 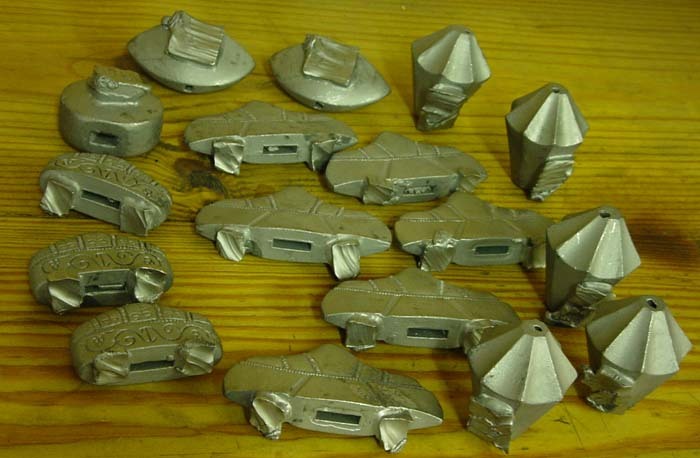 It is from these molds that the investment or production waxes will be made. It is critical that the mold be perfect and durable enough to produce waxes time after time which will be true to the original in every detail and require as little clean-up as possible. 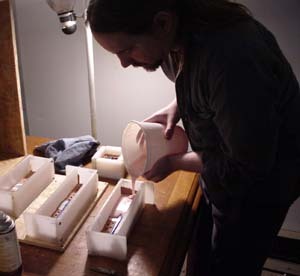 Leif pulling investment waxes from the production molds. Rough investment waxes from the production molds, prior to clean-up. 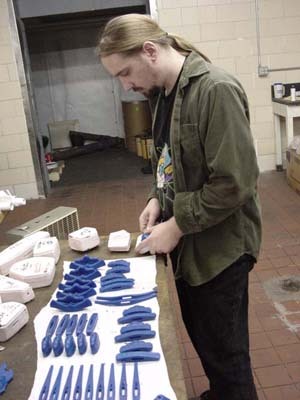 Waxes are poured in these molds on a production schedule, anticipating demand for the pieces being produced. 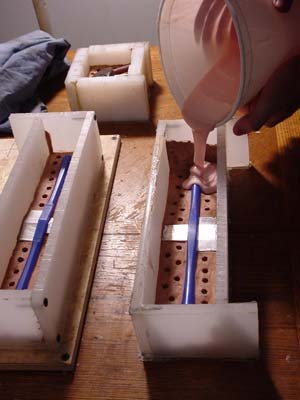 Each wax is poured, allowed to cool, and then removed from the mold. The waxes are examined for flaws or surface blemishes and are either repaired or rejected. Many hours are spent pouring, examining and preparing waxes for casting. Rejected waxes are re-melted and the wax reused. Each investment wax made from these molds is used only one time, as it is destroyed in the investment process. 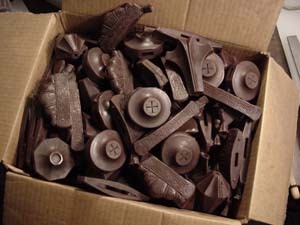 Waxes are sent to the foundry for investment and casting. Albion uses only small US foundries for the casting of our hilt components. After the waxes are sprued, they are submerged in liquid investment solution -- a slurry much like ceramic (for more detailed pieces, investment solution is often pre-painted on the wax, either with a brush or by spray-painting). This coating is treated the same as any ceramic or clay pot -- it is allowed to dry and is then fired in a kiln, upside down, to both harden the ceramic shell and to "burn out" the investment wax. The now empty investment shell has a "negative space" inside, which will receive the molten metal and form it to the shape of the original wax. When the piece is cast, it is sent to us from the foundry with the base of the sprue in place and the surface texture of the casting untouched -- we do all of the clean-up in our workshop in order to maintain the integrity of the volume and surface detail. 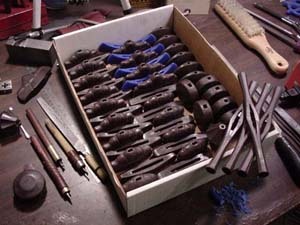 Once back at Albion, the hilt components have the large sprues carefully ground away. An initial refinishing done on the entire component (there is always a slightly "pebbly" surface from the investment that must be polished away) and the piece is reviewed for flaws. Some details that may have been lost in the casting process can be restored with care. Some minor flaws are sometimes intentionally left in the component, to recreate the "character marks" found on hand-forged hilt components. Once all detail has been restored, the component is prepped for assembly. Though some processes, like cleaning up rough castings, are done as batches, we treat each sword assembly as a separate project for both craft and quality control reasons. 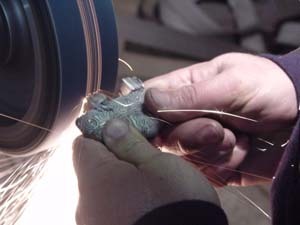 One set of castings is individually fitted to one particular blade as the first step of final assembly. 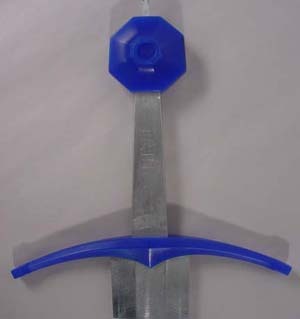 The guard is first wedged on to the blade. The slot has been specially cast to have a slightly undersized tang opening. 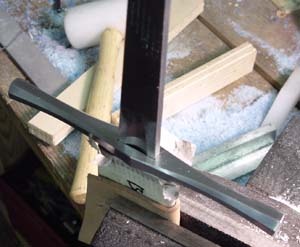 Hand filing brings the guard to within an inch of the base of the blade . It is then the hammered into place, seating it firmly on the shoulders of the blade. The edges of the tang opening on the top of the guard are then "peened" with a hammer to wedge the sides even more firmly against the tang. Next, the pommel is fitted to the tang-end. 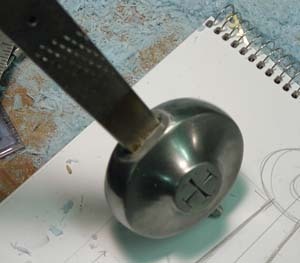 This also requires some hand-filing of the tang slot before the the pommel is hammered into place, ensuring that it will seat firmly in the proper location. 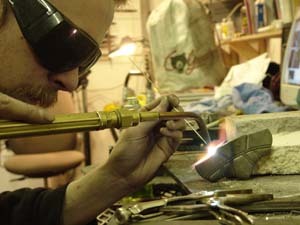 The pommel is then hammered on to the tang-end, wedging it permanently into position at the end of the blade. The end of the tang protruding from the pommel is then filed into shape to prepare it for peening. In some models, a decorative rivet block is also added: a separate piece (usually a truncated pyramid shape) that sits flush on top of the pommel. 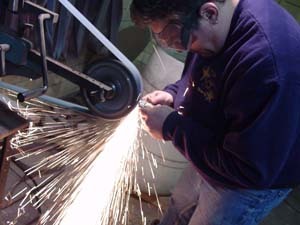 The sword is locked into a vise and heat is applied to the tang end. 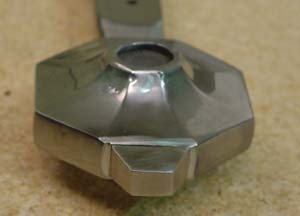 The tang-end is then gently hammered until it fills the recessed cavity in the pommel. 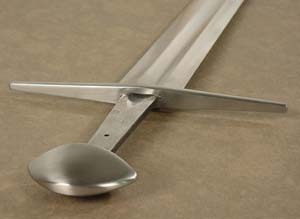 While cooling, the peen is either hammered flush or into a rough decorative shape, depending on the demands of the particular sword model. The peen is then carefully finished, by either being ground flush and polished, or hand-filed into a decorative peen block. Where a rivet block is required, the tang is then peend over the end of the rivet block and then both the peen and the rivet-block are hand-filed to final shape. Note: due to the fact that the pommel is permanently wedged into place on the tang, the peen is not what holds the sword together. Each component is seated independently of the others. The tang is then hand-fitted with a specially made stabilized birch core. We use stabilized wood, as it is less likely to expand or shrink from changes in weather and humidity, and is stronger and more durable for heavy use. The shape and volume of the core varies depending on the model of sword. Once the core is fitted and epoxied permanently into place, risers and other details are added (as they were historically) using linen or cotton cord. The diameter, spacing and height of the cord risers vary depending on the authenticity demands of the period.